Since about 1980, an important paradigm has emerged in the geosciences, analogous to the plate tectonics revolution of the 1950s and 1960s. This paradigm, called "Earth System Science" acknowledges that changes in the solid earth result from interactions among the atmosphere (air), hydrosphere (water and ice), biosphere (life) and the lithosphere as well as the human dimension (or anthroposphere) and the solar system and interplanetary space (or exosphere). Some good examples would be the increasing awareness of the role of microbes in generating ore deposits and the way tectonics influences weathering rates, which in turn affect global climate. Earth System Science also includes studies of the ways energy and materials cycle through the different "-spheres" as well as the workings of climate and the biosphere. Material cycles such as "The Rock Cycle," which appears in almost every introductory geology book, are quite familiar. Earth system science, by contrast, shows how elements like carbon or energy sources like solar radiation cycle through the lithosphere and all of the other "-spheres." 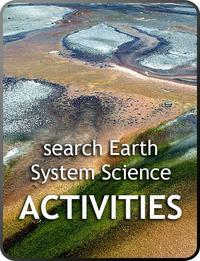 Click the images above to browse teaching activities and course descriptions related to Earth System Science topics. Collections are contributed by faculty and may include service learning projects, writing assignments, field trips, course descriptions and syllabi. 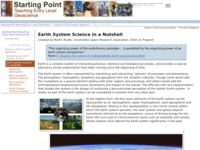 Earth System Science in a Nutshell: This Starting Point module describes what Earth System Science is and examines how shifting the educational paradigm to use this approach can yield significant gains in student learning. 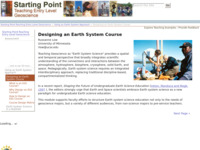 Designing an Earth System Course: This Starting Point module describes various ways of developing Earth System Science courses based on the role they are intended to play in the curriculum. The primary mechanism in these cases is using a matrix approach to content coverage. 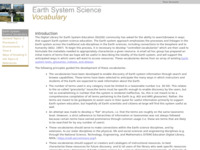 Earth System Science Vocabulary: This resource, developed for the Digital Library of Earth System Education, lays the groundwork for a comprehensive set of vocabulary terms that describe the Earth System in a way which makes categorizing and discovering electronic resources more easily accomplished. Developing Student Understanding of Complex Systems in the Geosciences: Explore resources about developing students' understanding of complex systems, including promising pedagogical approaches, tips on assessment, activities, and course descriptions, and much more. InTeGrate: Teach Systems Thinking: This website is built around the idea that systems thinking is particularly well-suited to teaching about the complex challenges that lie at the intersection of Earth systems and human interactions. 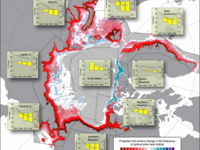 The InTeGrate project addresses topics such as climate change, energy, population dynamics and resource use, focusing on a systems-based, interdisciplinary approach. 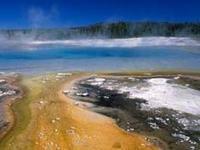 Exploring the Yellowstone Geoecosystem: The Yellowstone collection contains an assortment of digital resources relevant to the many components of the Yellowstone Geoecosystem. This collection contains an abundance of maps, images, virtual field trips, datasets, technical papers and general information. 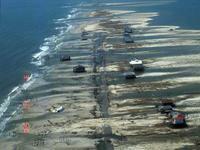 The Hurricane - Climate Change Connection: This website focuses on recent hurricanes and the latest climate change research to engage students and help them understand the central issues of climate change and hurricane activity. Teaching Climate Change: This site will allow educators to locate and use the best resources for teaching about Earth's climate system and the changing climate over the past one million years. 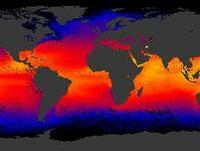 Here you will find climate data, visualizations, teaching activities and case studies. Microbial Life - Educational Resources: This site contains a variety of educational and supporting materials for students and teachers of microbiology. You will find information about microorganisms, extremophiles and extreme habitats, as well as links to online provides information about the ecology, diversity and evolution of micro-organisms for students, K-12 teachers, university faculty, and the general public. Teaching Biocomplexity in the Geosciences: This site contains a variety of resources for educators who teach courses related to biocomplexity, including biological, geological, chemical, physical and human systems. You will find links to activities and assignments, internet and computer resources, publications, and presentations from a 2003 workshop. Teaching about the Early Earth: The formation and evolution of the earth as an integrated system is a concept that also has direct applications for teaching. 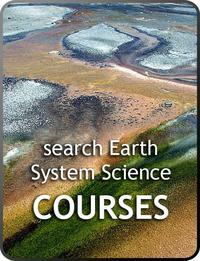 This website offers a growing collection of teaching materials and research results that will aid in the understanding of and teaching about the early earth. All Things Cretaceous: The Cretaceous collection was created to allow students and teachers alike to explore the complex relationships between physical Earth, changing climate and sea level, biota (evolving and extinct), and implications for modern society that are related to this amazing period of Earth's history. 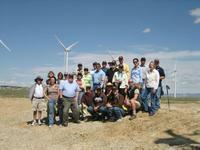 Teaching about Energy in Geoscience Courses: This site On the Cutting Edge website explores how educators can bring the serious issues surrounding energy production, extraction, and use into the classroom and how the many overlapping interests and drivers affect the real-world energy situation. Geology and Human Health: This site contains a variety of educational and supporting materials for educators teaching in the emerging field of geology and human health. You will find links to internet resources, books, teaching activities, and a group email list, as well as posters, presentations and discussions from a 2004 workshop. Impacts of Resource Development on Native American Lands: This collection contains an assortment of digital resources relevant to exploring Native American land and resource development by using investigative case studies. 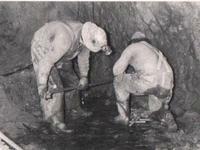 Resources considered include gold, uranium, coal, and water. 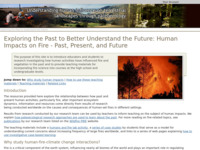 Understanding Human Influence on Terrestrial Landscapes through Paleoecology: This project has developed resources about using paleoecology to understand how human-set fires have changed the environment. 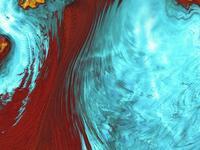 It includes a set of case studies written by students exploring megafires around the world, their causes and impacts.